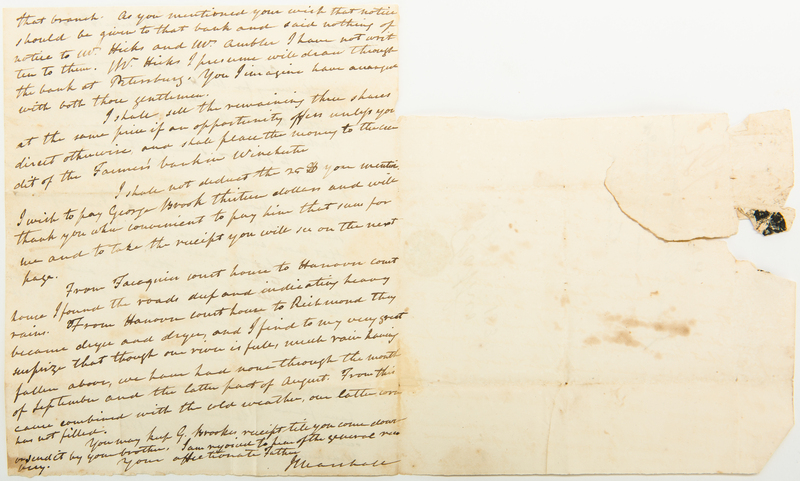 Handwritten letter from John Marshall (1755-1835), 4th Chief Justice of the United States. ALS. 2pg. 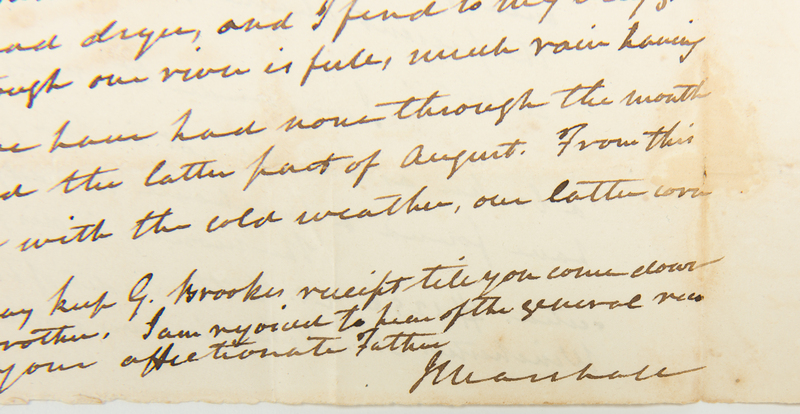 September 18, 1832. No place. A lengthy autograph letter signed "J Marshall" to his son James K. Marshall. 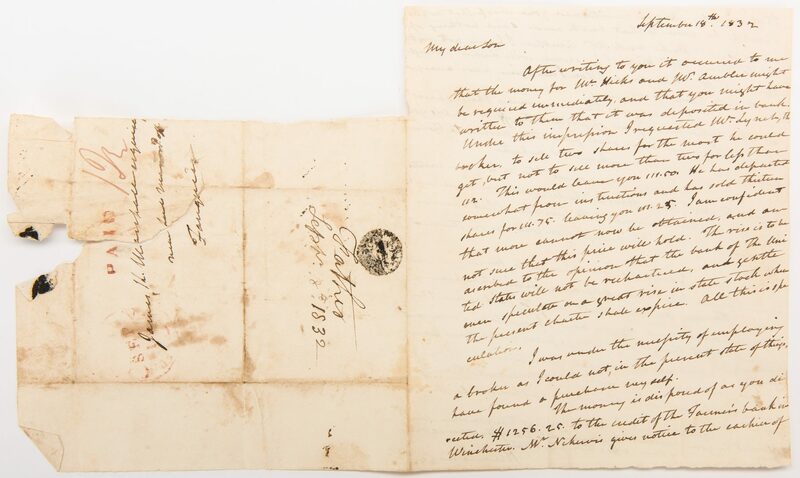 He communicated about financial matters, and wrote in part: "After writing to you it occurred to me that the money for Mr. Hicks and Mr. Ambler might be required immediately, and that you might have written to them that it was deposited in the bank. Under this impression I requested Mr. Lynch, the backer, to sell two shares for the most he could get, but not to sell more than two for less–This would leave you 111.50. He has departed somewhat from instructions and has sold thirteen shares for 111.75 leaving you 111.25. I am confident that more cannot now be obtained, and am not sure that this price will hold. The rise is to be attributed to the opinion that the Bank of the United States will not be rechartered, and–speculation on a great rise in state stock when the present charter shall expire. All this is speculation. 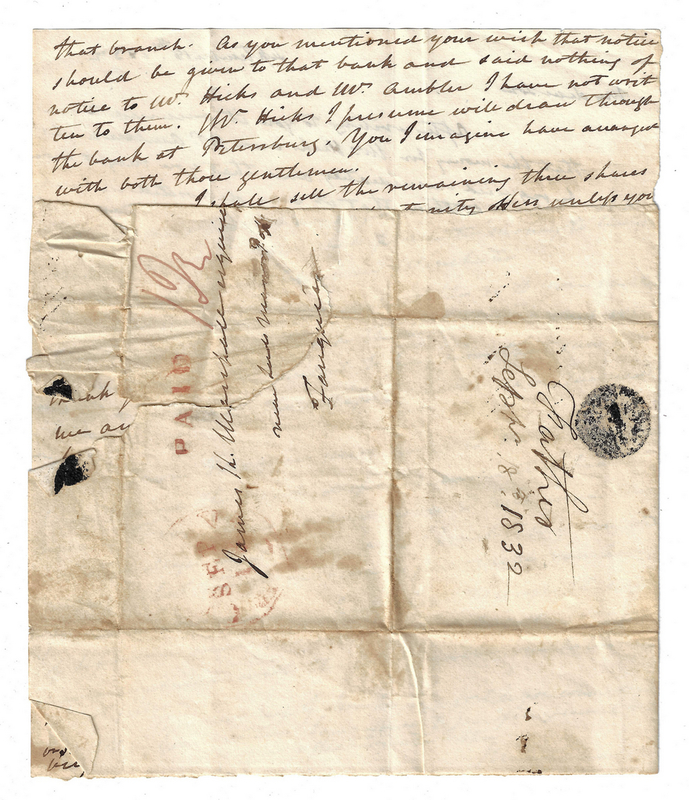 I was under the necessity of employing a broker as I could not, in the present state of things, have found a purchaser myself–I shall sell the remaining three shares at the same price is an opportunity offers unless you direct otherwise, and shall place the money to the credit of the Farmer's bank in Winchester". 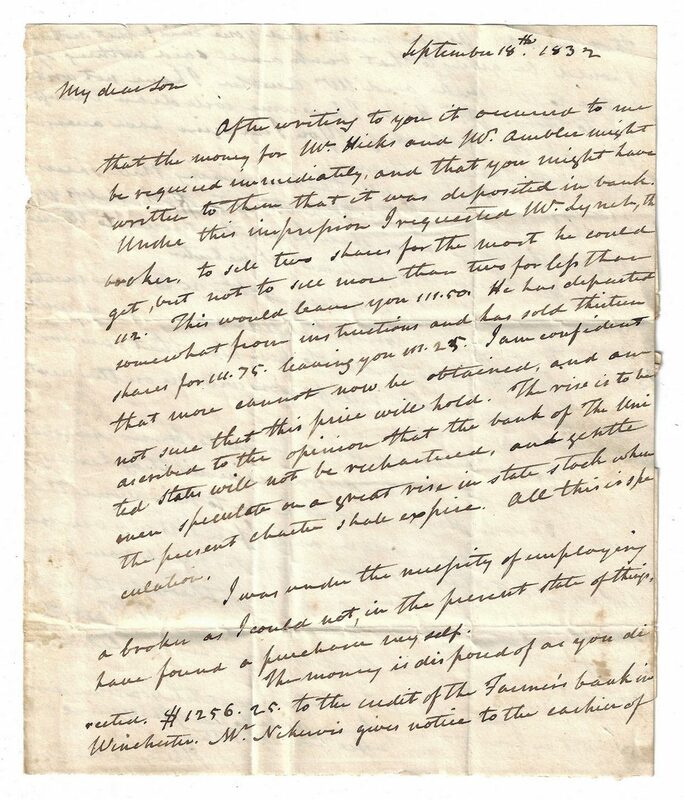 Marshall was correct; the Second Bank of the United States, which was a campaign issue in 1832 (and vehemently opposed by Andrew Jackson) was not rechartered; it became private in 1836 and liquidated in 1841. 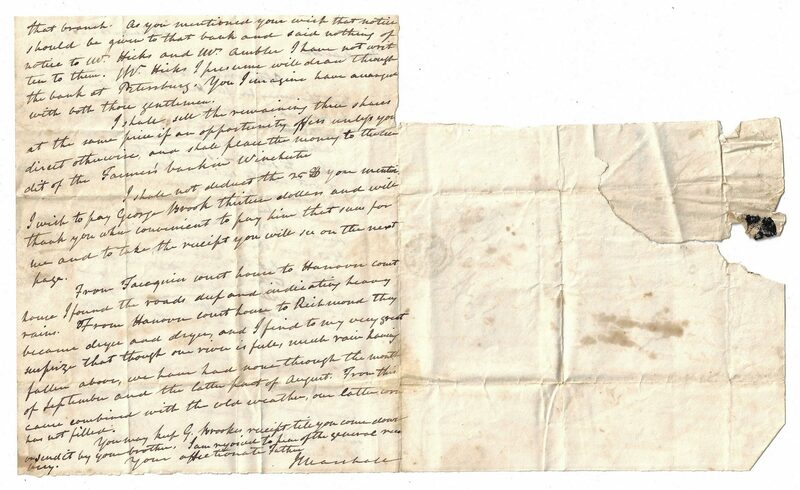 The letter has mailing folds and dark ink. 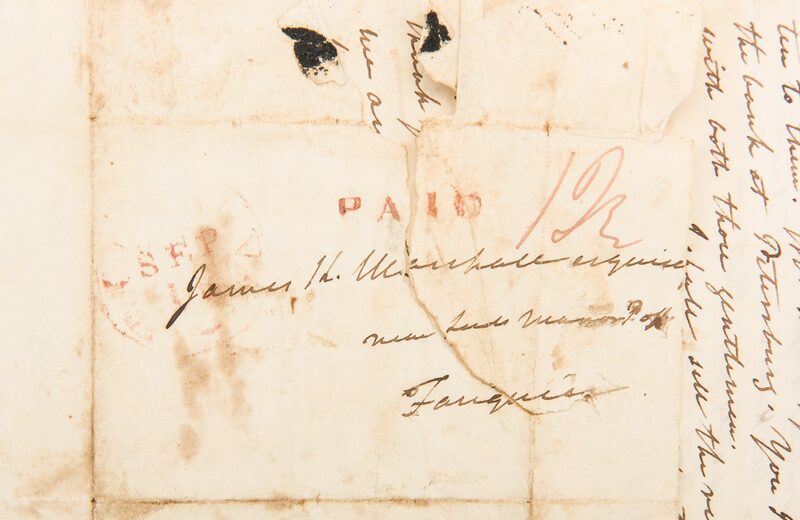 The address leaf, completed in the Chief Justice's handwriting, is still attached although the top third of it is missing but not affecting any words. 7 5/8" H x 6 3/8" W. Provenance: The Estate of Charles Boyd Coleman, Jr., Chattanooga, TN, by descent from Lewis Minor Coleman, Jr., son of CSA Lt. Colonel Lewis M. Coleman and Mary Ambler Marshall, daughter of James K. Marshall and granddaughter of John Marshall (1755-1835). Lewis M. Coleman Jr. was also related to the family of General Henry Dearborn by his marriage to Julia Wingate Boyd, daughter of Annette Maria Dearborn Boyd, who was the daughter of Greenleaf Dearborn (1786-1846) and great granddaughter of Henry Dearborn (1751-1829) on her mother's side. Description courtesy of Stuart Lutz Historic Documents, Inc. CONDITION: Overall good condition with tears, primarily to address page, foxing spots, dampstaining, light toning, to be expected from age (see description). Marshall signature in strong, clear condition slightly affected by minute foxing spots.